(Phys.org)—Advancements in surface-enhanced Raman spectroscopy using a scanning tunneling microscope under ultrahigh vacuum and low temperature have allowed a group of researchers from The University of Science and Technology of China to distinguish two different, but structurally similar, adjacent molecules adsorbed on a silver surface. This level of precision and sensitivity could allow for advancements in surface chemistry and precise monitoring of DNA sequencing and protein folding. Their work appears in a recent issue of Nature Nanotechnology. Prior work by this group used plasmon-enhanced Raman imaging to isolate a single molecule of meso-tetrakis(3,5-di-tetrarybutyl-phenyl-porphyrin), or H2TBPP, that was located within the STM nanocavity under ultrahigh vacuum and low temperature. Using the optimized conditions to isolate a single molecule, they now report being able to distinguish between two porphyrin-derived molecules, H2TBPP and zinc-5,10,15,20-tetraphenyl-porphyrin, or ZnTPP. These structurally similar molecules are within van der Waals distance from each other and are adsorbed onto a Ag(111) substrate. They were able to achieve this kind of sensitivity using tip-enhanced Raman scattering (TERS). TERS is a Raman enhancing technique that confines Raman measurements to the area within the STM tip, an area spanning 0.5 nm. This spatial confinement allows for highly precise measurements of individual molecules. Aside from the large signal enhancement, an advantage to using TERS is that the interaction between the molecule and metal substrate removes the potentially overbearing fluorescence signal while the non-linear process involved helps to improve spatial resolution. Additionally TERS is non-invasive which maintains the structural and chemical integrity of the sample, and it can distinguish between different molecular configurations of surface-adsorbed molecules. 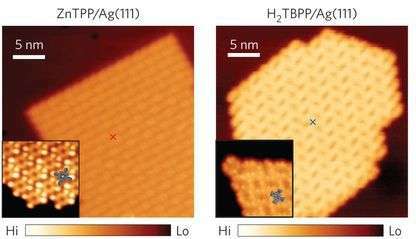 The first part of this study looked at individual molecules of ZnTPP and H2TBPP on separate Ag(111) surfaces. Although both of these molecules have similar structures, their Raman spectra were distinctive, suggesting that one could distinguish the two molecules if they were on the same surface. Jiang, et al. also found that the TERS spectra were different from the corresponding powder Raman spectra of both molecules, suggesting that this data combined with density functional theory simulation could provide information on molecular configuration on the metal surface. The next part of the study was to look at ZnTPP and H2TBPP on the same Ag(111) surface. They looked at two different molecular "islands" that were approximately 2.5 nm apart, one with ZnTBPP and the other with H2TBPP molecules. The islands had a bare Ag(111) surface in between. They found that the TERS spectra for the top island portion of the surface resembled ZnTPP while the bottom island had spectra that resembled H2TBPP. Jiang et al. observed that molecules along the edge of an island had weaker TERS spectra compared to molecules within an island. They ran sequential TERS measurements and were able to distinguish between the ZnTPP molecular island, including the molecules along the edge and the H2TBPP molecular island and its edge molecules. They found that even when two molecular islands are within van der Waals distance from each other, analysis of the TERS spectrum along the line trace distinguishes between an edge molecule on the ZnTPP island and an edge molecule on the H2TPP island. The ability to distinguish between an island and a step-edge molecule is due to differences in surface configurations. Based on DFT calculations and experimental data, ZnTPP, in particular, had several distinctive configurations. These are based on in-plane and out-of-plane angles of the phenyl rings and the tilting angle. The ability to distinguish between two molecules on a surface as well as determine their adsorption configuration and orientation opens the door for studying surface catalysis as well as other biological systems. Unambiguous chemical identification of individual molecules closely packed on a surface can offer the possibility to address single chemical species and monitor their behaviour at the individual level. Such a degree of spatial resolution can in principle be achieved by detecting their vibrational fingerprints using tip-enhanced Raman scattering (TERS). The chemical specificity of TERS can be combined with the high spatial resolution of scanning probe microscopy techniques, an approach that has stimulated extensive research in the field. Recently, the development of nonlinear TERS in a scanning tunnelling microscope has pushed the spatial resolution down to ∼0.5 nm, allowing the identification of the vibrational fingerprints of isolated molecules on Raman-silent metal surfaces. Although the nonlinear TERS component is likely to help sharpen the optical contrast of the acquired image, the TERS signal still contains a considerable contribution from the linear term, which is spatially less confined. Therefore, in the presence of different adjacent molecules, a mixing of Raman signals may result. Here, we show that using a nonlinear scanning tunnelling microscope-controlled TERS set-up, two different adjacent molecules that are within van der Waals contact and of very similar chemical structure (a metal-centred porphyrin and a free-base porphyrin) on a silver surface can be distinguished in real space. In addition, with the help of density functional theory simulations, we are also able to determine their adsorption configurations and orientations on step edges and terraces.